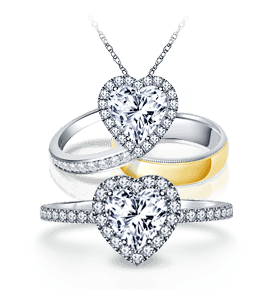 Cut is the basic facet arrangement of a diamond. It is the only attribute in a diamond a human can modify unlike color and clarity as it decides how a light ray will enter and get refracted from a diamond. The finer the cut, the brilliant is the diamond’s shine and the more is its value. Hence it is one of the most important criteria for judging a diamond's value as it directly affects its appearance. Cut of a diamond affects its Brilliance (reflection of light), whereas Polish (smoothness of facets) and Symmetry (alignment of facets) affect the sparkle of a diamond. A poor polish can make a diamond look dull and a poor symmetry can misdirect the light reducing the sparkle. In which light refracts away through the bottom. In which light gets reflected through the top producing maximum brilliance. In which light refracts away through the sides. Excellent Cut : The rarest cut grade of all, Excellent cut reflects maximum light entering the diamond and thus shines with optimum brilliance. Very Good Cut : Very Good cut grade may cost less than the Excellent cut, but it is equally beautiful and brilliant. Good Cut : Good cut grade of a diamond helps reflect light to obtain a good amount of brilliance, though not equal to the Excellent or Very Good cut. Thus it demands a much lesser price. Fair Cut : Being not as brilliant as a Good cut, Fair cut grade quality diamonds refract less amount of light, but make a better choice than Poor cut diamonds. Table : The topmost and largest facet of a diamond. Crown : The sloping section of a diamond- from the girdle to the table. Girdle : The point where the crown and pavilion meet, which also determines the perimeter of the diamond. Diameter : The width of the diamond measured with reference to the girdle. Pavilion : The lower section of a diamond from the girdle to the culet. Culet : The tip of a diamond (the best culet is invisible to the naked eye). 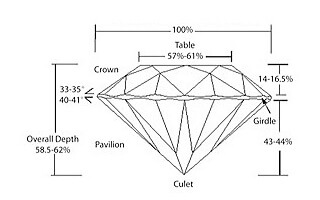 Depth : The height of a diamond measured from the culet to the table. If you want to buy a diamond with utmost brilliance, then Excellent cut grade is a suitable option with good polish and symmetry. 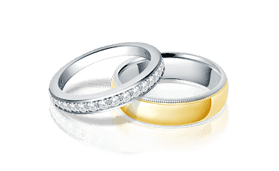 However, if the budget restricts you, a diamond with good polish and symmetry and excellent or very good cut can be chosen in G-H color and SI1 or SI2 clarity. 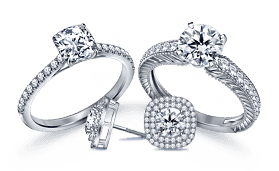 B2C Jewels serves a wide range of Loose Diamonds with Excellent, Very Good, Good and Fair cut, selectable according to your choice.